A conventional mine-clearance approach uses machines and deminers with metal detectors. When the APOPO HeroRATs are added, they can significantly speed up operations. This makes considerable cost savings and gets people back on their land as quickly as possible. Because areas suspected of landmine contamination have not been touched for decades, they are often overgrown and inaccessible. Ground preparation machines improve mine clearance by softening the soil, neutralizing tripwires and clearing small trees, bush, shrubs and grass. Safe lanes provide safe access to minefields. They are one or two metres wide and are prepared by deminers with metal detectors. APOPO HeroRATs only detect the scent of explosives and ignore scrap metal. One HeroRAT can search an area the size of a tennis court in 30 minutes - this would take a manual deminer with a metal detector up to four days (depending on the levels of scrap metal present). 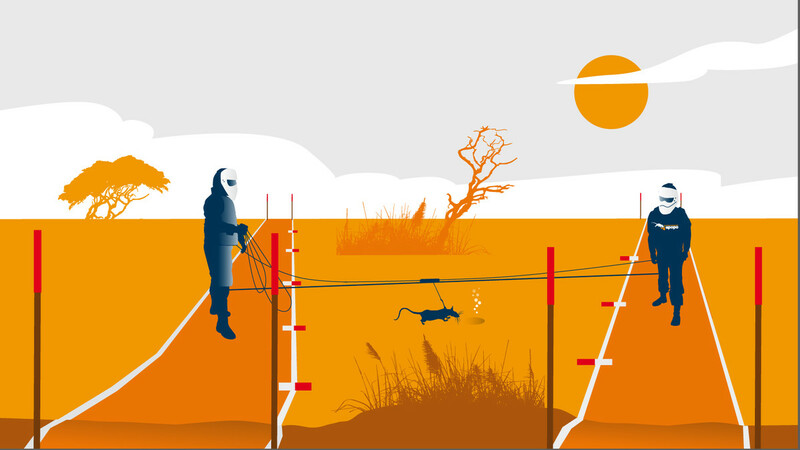 When a HeroRAT indicates the presence of explosive, a deminer with a metal detector arrives to carefully excavate the marked position and confirm if a landmine is present. If a landmine exists, it is safely demolished on the spot. After the landmines and other explosives are cleared, APOPO returns safe land to communities to use productively and without further fear of injury.